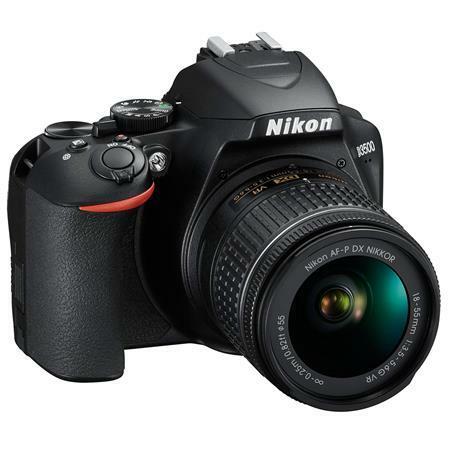 The Nikon D3500 is an entry-level model that makes it easy to share photos using a smart device. This camera is targeted to those who are new to photography and are seeking to step up their game. The D3500 has an effective pixel count of 24.2 megapixels and supports a standard sensitivity range of ISO 100–25600. When used with a NIKKOR lens, it lets you capture a wide variety of scenes with superior image quality and bokeh characteristics. This DSLR is constructed with the same slim and lightweight monocoque structure as the Nikon D5600, as well as with a deep grip that offers an easy hold on the camera and makes for more comfortable shooting. A new layout for operational controls, including an even larger playback button, and adjustment and concentration of the most important buttons at right on the back of the camera, enables a user-operation that is smooth and intuitive, even for beginners. In addition, a constant connection between the D3500 and a smart device is possible using the SnapBridge app and Bluetooth technology. JPEG thumbnails (2 megapixels) of images captured with the camera can be automatically transferred to the smart device, and the latest version of the app, SnapBridge Ver. 2.5, can be used to control remote capture of still images from the smart device over a Bluetooth connection. Nikon is Offering an effective pixel count of 24.2 megapixels and has equipped it with a Nikon DX-format CMOS sensor with no optical low-pass filter, the D3500 is able to capture images that make the most of the superior resolving power of NIKKOR lenses. The camera supports the broad ISO 100–25600 range of standard sensitivities that enables the beautiful capture of dimly lit indoor scenes and night landscapes at high sensitivities with hand-held shooting. Approximately 1,550 shots are possible with a single charge.